Disabled activists were outside the House of Lords today (Friday) for a highly personal protest about the latest attempts to legalise assisted suicide. As peers continued the committee stage of Lord Falconer’s assisted dying bill protesters from Not Dead Yet UK (NDY UK) made their voices heard outside parliament. Each placard includes the name and picture of a disabled or terminally-ill person whose impairment has prevented them from attending the protest, and a message explaining why they oppose the bill. Another performer, comedian Laurence Clark, says: “Throughout my life, doctors’ negative prognoses about me have consistently proved wrong. And Liz Carr, the actor and performer who is also playing a key role in the NDY UK campaign, says on her placard: “To prevent even one innocent life being lost, capital punishment is no longer legal in the UK. Lord Falconer’s assisted dying bill would make it legal for doctors to help end the lives of those they judged to be terminally-ill, if the individual requested such help. NDY UK said that “celebrity supporters” of the bill were well-known but politicians needed to “hear and value the opinions of people living with terminal illnesses and severe disabilities”, because the proposed legislation would put lives at risk, while the safeguards contained in the bill were inadequate. NDY UK member Sian Vasey added: “When people ask to be assisted to die, this is often in isolation and before everything possible has been done to alleviate their situation in terms of medical, social and emotional support. 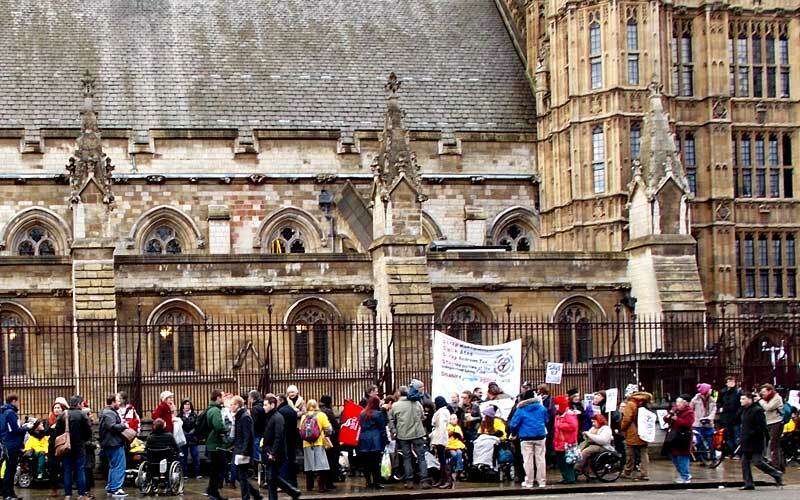 Reports this week suggested that the pro-assisted suicide organisation Dignity in Dying (DiD) would not be staging a counter-demonstration outside the House of Lords, but would rely instead on social media to make its case. NDY UK members had been concerned at what they say was aggressive behaviour by DiD supporters at a protest outside the Lords on 7 November, during the first day’s discussion of the bill’s committee stage. One disabled protester was allegedly hit with a fist, others were intimidated and verbally abused, while some pro-euthanasia campaigners apparently encouraged drivers to run over disabled activists who were blocking the road in a peaceful direct action. The claims were denied at the time by DiD. Meanwhile, disabled campaigners in Scotland staged their own protest outside the Scottish parliament, as MSPs on the health and sport committee discussed a bill originally devised by the late MSP Margo MacDonald. Her assisted suicide (Scotland) bill is now being spearheaded by the Green MSP Patrick Harvie. His party’s official policy is to legalise assisted suicide. The committee was holding the first of several sessions in which it will take expert evidence on issues such as the law, ethics and palliative care, and hear from disability organisations, including Inclusion Scotland.